As the Meiji period (1868-1912) recedes further back in time and scholars strive to better fathom its pivotal nature, more and more attention is being paid to its once much maligned woodblock prints. Judging from the print record of the late 1870s and early 1880s, the second decade of Meiji must have been a particularly unsettling time for Japanese society. The populace, only a few years removed from a civil war triggered by the drastic Edo to Meiji regime change, was perhaps experiencing negative fall-out from industrialization and other double-edged Western imports. In any event, the popular artistic medium that had once ballyhooed "civilization and enlightenment" (Bunmei kaika, the Meiji slogan for modernization) now took to betraying signs of nervousness and disenchantment. In Tokyo, many of the overly busy, satirical prints of the visionary eccentric Kyôsai (1831-1889) — not to mention the ghost and demon-obsessed work of Yoshitoshi (1839-1892) — suggest a society weirdly out of joint. Similarly, Kiyochika (1847-1915) and his student Yasuji (1864-89), working in the traditionally untroubled genre of landscapes, substituted moody gloaming and foreboding gloominess in place of the cloudless sunrises so much in evidence in ukiyo-e produced in the immediate wake of the 1868 Restoration. In truth, some of this was simply an attempt to offer the public a novel, European look. But why borrow only the darker pages from the foreign artists' notebook? The answer may lie in the fact that, on top of perceiving the distress in the culture at large, woodblock print designers were also staring at their own extinction. Indeed, the centuries-old ukiyo-e tradition stood in deep peril. For one thing, photography and a raft of cheaper, less arduous lithographic techniques were washing ashore one by one. For another, the aspects of urban culture most intimately associated with ukiyo-e — the worlds of kabuki and courtesans -- no longer exerted such a meaningful grip on the public imagination. Instead of commanding everyone’s attention, they were now merely niche entertainments in a rapidly-Westernizing society. The drop-off in the demand for kabuki imagery was especially disastrous for the woodblock business in Osaka, where for 100 years scant attention had been paid to any other type of print. As the few publishers there still committed to ukiyo-e in the late 1870s struggled to diversify, topical subject matter like the 1876 civil war (Seinan sensô-e) and sensationalized local news pictorials (nishiki-e shinbun) emerged from their workshops ... plus the very occasional landscape series. Similar to Kiyochika's work at this time, the prevailing tone of Meiji Osaka landscapes runs to the somber, but the air of moodiness seems to have been carried a disturbing step further. 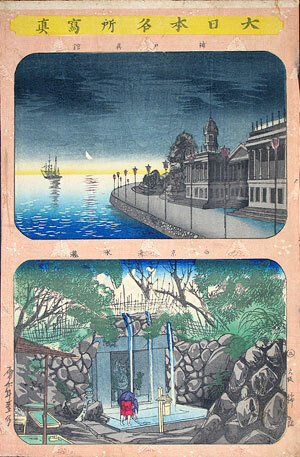 In the series "Views of Osaka and Kyoto" (Keihan meisho zue), designed by Nomura Yoshikuni (aka Yoshikuni II; 1836-1904, active 1850-80s), celebrated tourist spots appear bleakly alienating while shorelines suffer buffeting from squalls. Fig. 1 shows a sheet from another edge-of-oblivion Osaka landscape series, this one by Raisai Toshimoto (active late 1870s-early 1880s). Despite the expansive-sounding title ("Views of Japan," Dai Nippon meisho shashin) most of the 16 known images — two to an ôban sheet, often found cut up) — center around the Kansai region, the area of Western Japan anchored by Osaka. In the top view, the Kobe foreign settlement appears far more depressing than romantic, despite the moon and masts, and eerily devoid of the bustle so prevalent in Konobu's ebullient views of the same waterfront a few years before. Likewise, the lower image, though one of the least stark of the series, nonetheless implies that the much-visited and fun-filled Kiyomizu Temple waterfall in Kyoto can be a rather cold, lonely spot. Woodblock printing survived its mid-Meiji troubles, of course, and especially its landscape tradition re-emerged with sweeping confidence in the 20th century, but halfway along the long road from Hiroshige to Hasui, the genre somehow lost sight of the sun. This article originally appeared in Daruma, no. 58, Spring 2008. Copyrighted © text and pictures reprinted with permission.